Steve Nash and Yao meet at half court Friday night after the charity game they held in Beijing to benefit poor children in Western China. Yao scored 21, while Nash scored 13. Click here for photos from the pre-game warmup and introductions. Click here for photos from the game. 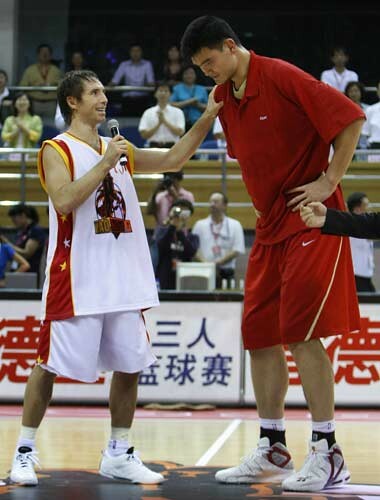 Yao Ming scored 21 points in his charity game played in Beijing Friday night in which the Chinese team won 101-92. Steve Nash scored 13 points, and interestingly, it sounds like Carmelo Anthony played for the Chinese team in the second half, not Yao Ming as was expected. Yi Jianlian scored 20 points for the Chinese, and Phoenix Sun Leandro Barbosa led all scorers with 22 points. Click here for photos from the pre-game warmup and festivities, which includes Jackie Chan making a cameo. Click here for more photos from the game (and animated images of some cool Chinese team dunks!). This entry was posted on Friday, September 14th, 2007 at 3:11 pm	and is filed under Charity work, Rockets' off-season. You can follow any responses to this entry through the RSS 2.0 feed.